We are very fortunate to have Darlene Beck Jacobson, freelance writer, educator, Speech Therapist, and Children’s Book Author as a guest blogger. She is sharing with us her strategies to help children develop literacy and language development. 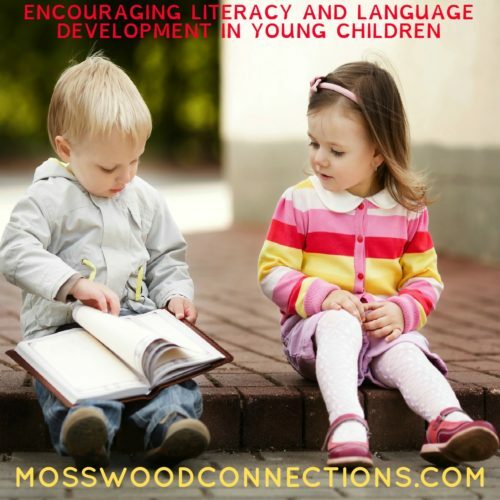 How can parents promote literacy and language development in young children? It is currently the trend in education to emphasize drilling sight words and pushing young children to read and write in Kindergarten and even preschool. While there is inherently nothing wrong with encouraging children to read, many 3-6-year-olds aren’t ready for this. What they are ready for is age-appropriate experiences that will not only increase language development and vocabulary but will also go a long way toward promoting literacy. 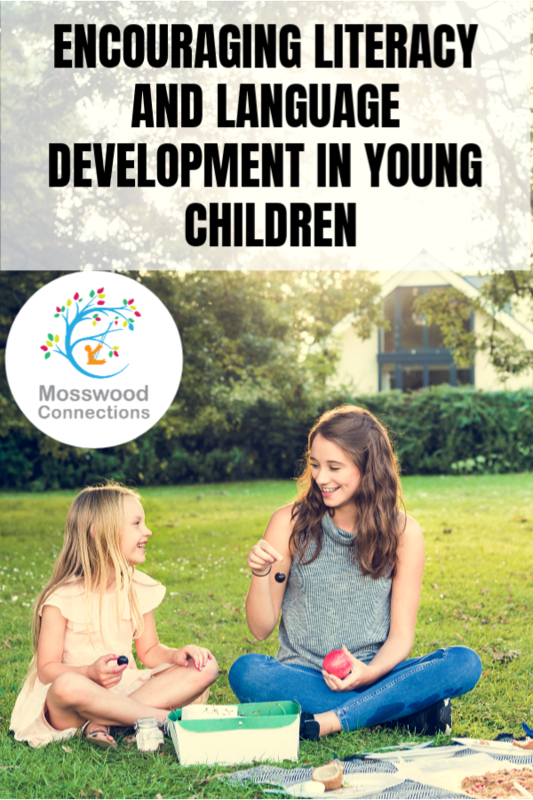 Here are a few suggestions for encouraging language development in young children. Help your child to talk. Talk to your child constantly. Tell him the names of things and what they are used for. Recite nursery rhymes and play rhyming games. Ask your child questions that require more than a yes or no response. Let them practice asking you questions. DON”T use baby talk; always speak clearly. Take her shopping, let her help do things around the house. Your child will learn a lot from simple chores like sweeping, folding clothes, matching socks, picking up toys, setting the table, washing dishes. Encouraging independence builds self-esteem which in turn makes for an eager learner. Go somewhere with your child. Visit zoos, museums, restaurants (where one is required to sit quietly and use utensils to eat). Go to the library, the airport, the park, playground, nature preserve, beach, petting zoo, etc. The more your child experiences first hand, the richer his vocabulary will be. Do craft projects together that include cutting, pasting, drawing, and painting. Competence in fine motor activities is an important skill in learning to write. The best way to learn how to use scissors, pens, and pencils is through practice. Using clay and PlayDoh also exercises fine motor muscles. Bake something from scratch. 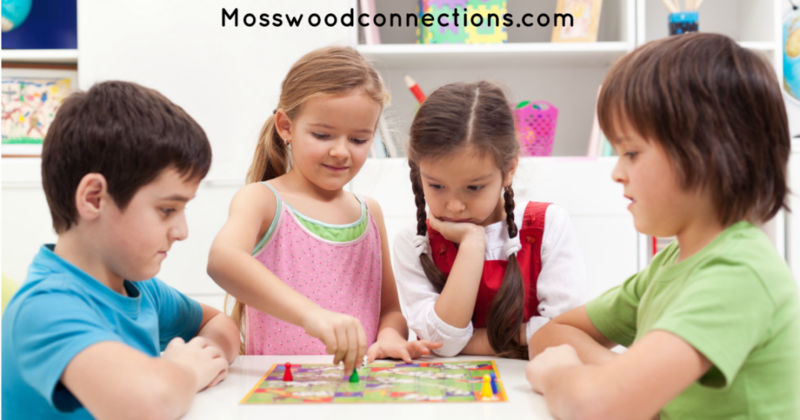 Play simple games like “Go Fish”, “Hide and Seek”, “Scavenger Hunt”. 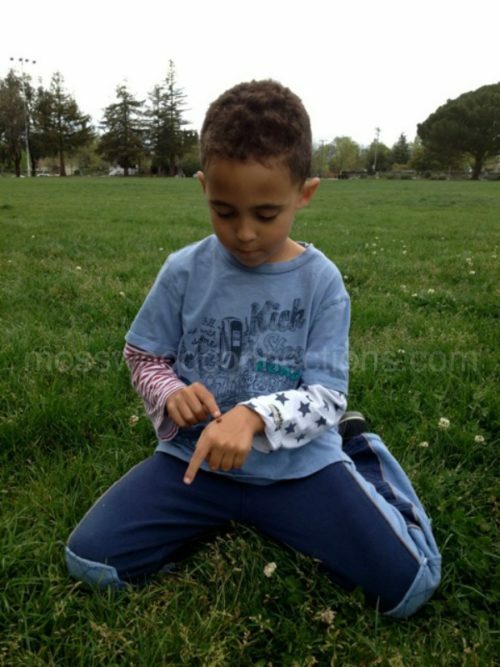 Teach your child to catch/throw balls of various sizes. Help her learn to fly a kite, catch a fish, ride a tricycle/bicycle/sled, build a sand castle. Run, hop, skip, and jump together. It felt good when you were a kid and it still feels good now. Play "house" and pretend games, let your child be the parent and you be the kid. Blow bubbles, make silly faces in the mirror, dance, and sing. Setting up an obstacle course is a great way to learn prepositions such as under, through, around, etc. 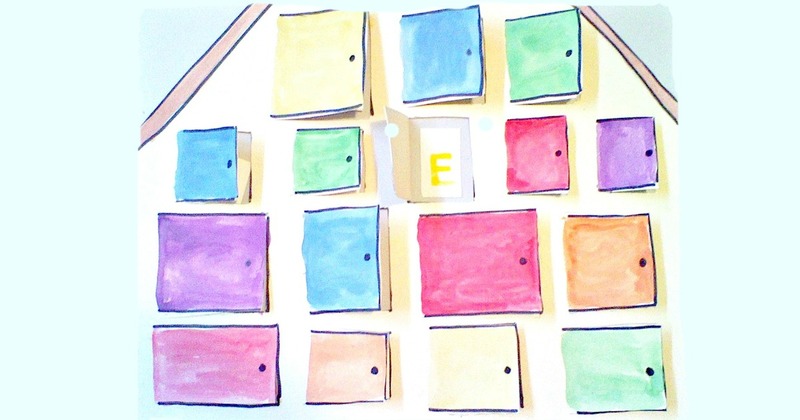 Help your child notice shapes, sizes, sounds, and colors. The grocery store is filled with sensory opportunities. Count and sort fruits and vegetables by size and color. Count the windows, doors, cups, plates, hats, or whatever around the house. Gather a pile of objects and sort them into categories. Have a RED DAY (or color of your choice) where everyone wears red, plays with red toys and eats red food. Buy toys that require thinking and imagination. Blocks, puzzles, take-apart toys, markers and paper, puppets, are all good choices. Build a tent by throwing a sheet over the kitchen table. Pack a lunch box with “camping food”. Add some pillows or sleeping bags and pretend to be camping. Let kids play with boxes…they LOVE them and will amaze you with the ways they use them. Put on a show and sing, dance, do tricks, taking turns being audience/performer. If you play video games, do it together and talk about it afterward. Experience nature firsthand by taking a walk together. Look for birds, insects, and other wildlife. Turn over rocks and fallen logs after a rainstorm and try to identify the bugs clinging to the surface. Feed birds by coating a pinecone with peanut butter and rolling it in birdseed. Hang them from trees and watch the birds come by. Borrow binoculars and a Field Guide from the library to identify them. Take things apart to see how they work. Get dirty! It’s okay to play in dirt and mud; it will make your child happier to be outside. Plant something together and watch it grow. A macaroni or Cheerios necklace, a clay pot, a paper bag puppet, a paper hat, greeting cards, cookies. Use fabric glue to cover an empty can with felt and store pencils and other items in it. Every time your child makes something herself, her confidence and abilities grow. Try using non-traditional materials to form letters such as sandpaper, or Playdoh, Your child can trace the letters with her finger for tactile reinforcement. Use pretzel dough. Shape the dough into letters before you bake it. For an easy pretzel recipe, visit my recipe page. Take books out of the library and read together. Let your child see you reading as well. Children learn by example. Makeup stories of your own and use props to act them out. A good site for self-publishing stories is www.storybird.com. You may notice many of the suggestions require very little in terms of money. ALL require you to spend time in meaningful interactions with your child enjoying everyday things. Being present – being in the moment – to engage and talk to your child about the world around her is the best way to promote literacy and language development. HAVE FUN! Darlene Beck Jacobson is available for workshops/classroom visits on character development, how to do research for historical fiction, and on developing teachers materials for your book to use in the classroom. 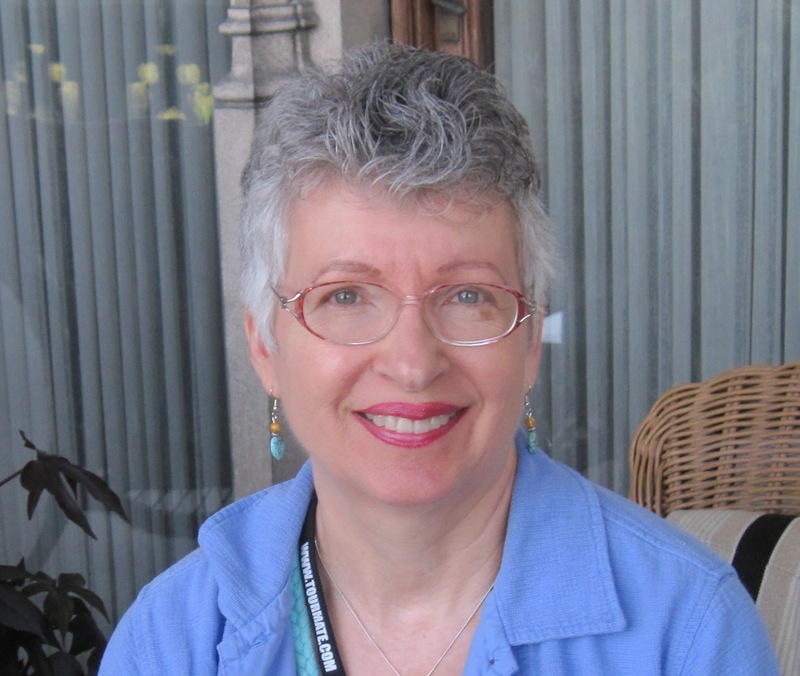 As a freelance writer and children’s book author, Darlene’s stories have appeared in CICADA, CRICKET, and other magazines. She is also the author of Wheels of Change; a historical novel about the Industrial Revolution. As a teacher and a speech therapist working with Preschool and Kindergarten aged children, Darlene has many opportunities for story ideas. Working with young children allows her the freedom to be as silly as she wants to an appreciative audience of 3-6-year-olds. “I can walk into the classroom wearing a chicken hat and still get hugs,” Darlene says.